Vollrath 68366 Wear-Ever Aluminum Roast Pan with Handles (Top) 11.25 Qt. TigerChef > Smallwares > Cookware > Aluminum Cookware >< Aluminum Roasting Pans > Vollrath 68366 Wear-Ever Aluminum Roast Pan with Handles (Top) 11.25 Qt. 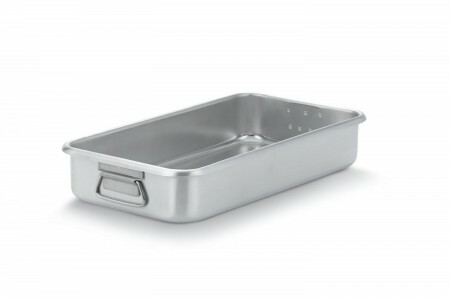 $8.78 Winco ALBP-1218 Bake Pan with Handle 17-3/4" x 11-1/2"
$17.99 Royal ROY BP 1117 Aluminum Bake Pan with Handles 11" x 17"
$21.99 Crestware ABP1117 Bake Pan 11" x 17"
$179.39 Vollrath 68360 Wear-Ever Aluminum Double Roaster Set with Straps 23.25 Qt. $163.01 Vollrath 68392 Wear-Ever Heavy-Duty Aluminum Roast Pan Cover with Handles 14 Qt. $168.89 Vollrath 68391 Wear-Ever Heavy Duty Aluminum Roast Pan with Handles 42 Qt. A must-have addition in any commercial kitchen, the Vollrath 68366 Wear-Ever Aluminum Roast Pan with Handles (Top) 11.25 Qt. is perfect for roasting meat and poultry. A versatile option, you can pair it with its bottom pan counterpart, creating a snug-fitting double roaster. Made from heavy-gauge 3004 aluminum, this exceptionally durable product distributes heat quickly and evenly, producing perfectly browned and thoroughly cooked meat. Thanks to its loop handles, this top roasting pan allows you to safely move it from the oven to the countertop even when wearing oven mitts. Dimensions: 19-3/4" x 10-7/8" x 3-5/8"